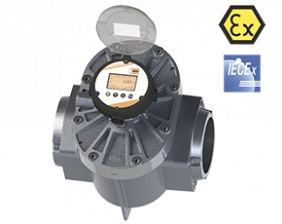 flange DN25 ... DN100, ASME 1 ... 4"
Oval gear flowmeters are categorised as positive displacement flow technology. When liquid flows through this type of positive displacement flowmeter, two oval geared rotors measure a constant volume per rotation within a precisely machined measuring chamber. With each rotation, a constant volume of liquid is measured. The rotation of the oval gears is sensed via magnets embedded within the rotors. These magnets transmit a high resolution pulse output. The output signal can be process externally via a remote display controller or PLC or via a variety of output/display options available as accessories attached to the flowmeters. The positive displacement flow technology allows for precise flow measurement of most clean liquids regardless of the media conductivity. Other liquid properties also have a minimal effect on the performance of this type of meter. Flow profile conditioning is not required as with alternative flow technology options making oval gear installations simple to install in tight spaces and at an economical price.